It’s just an intrasquad scrimmage Friday—though with some pretty good talent—to conclude the week of camp for the USA Basketball team (8:00 p.m. CT on ESPN). But it’s going to provide a preview of what looks to be some very highly entertaining basketball. “I think we’re going to swarm and play fast,” said former Bull Kyle Korver, who will be on a “blue” team with Derrick Rose. “The point guards here are just ridiculous. They are ridiculous. They have so much speed and power. I think we’re going to play hybrid lineups. We don’t have traditional post. We’re going to trap, go for steals, be in passing lanes, get out and run; we’re going to crash the offensive boards, shoot threes, make the extra pass, a fun, uptempo style of game. Waves of guys. Though he has played well in the scrimmages, Friday is truly his first game action against high level NBA talent since his second knee injury last November. And so will conclude the first act for the USA team in preparation for the FIBA Basketball World Cup in Spain starting Aug. 30. The USA team came to camp this week with 20 players. There’ll be a possible reduction to 15 before the team meets in Chicago Aug. 14 for two days of training and then their first exhibition game, an important one Aug, 16 against Brazil because Brazil has a big team. This USA team with top forwards Blake Griffin, LaMarcus Aldridge and Kevin Love withdrawing is relatively small. So coach Mike Krzyzewski and his staff, which includes Bulls coach Tom Thibodeau who will be coaching against Rose’s team Friday, have decided to play an active, aggressive, fast game to utilize their talent. Which is good news for Rose as the description and makeup of the pending team suggests Rose will be an integral member. 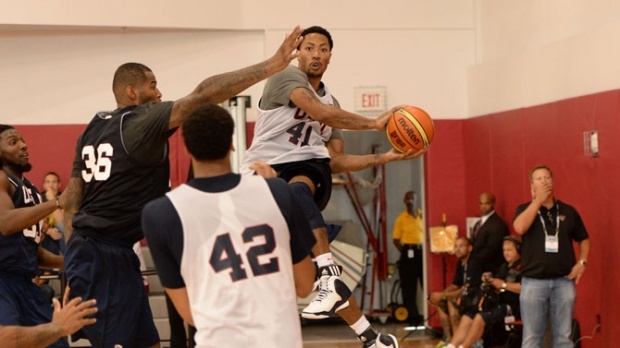 USA insiders have indicated Rose, Stephen Curry and Kyrie Irving are the point guards sure to make the team. Probably a fourth between Damian Lillard and John Wall will be added. 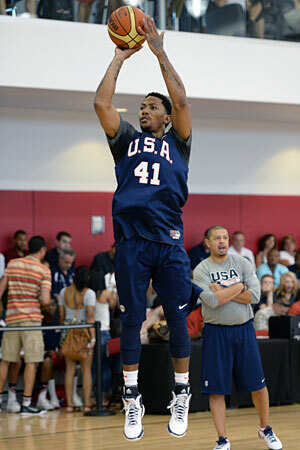 It is especially for Rose as has been chronicled all week in his return from a second knee injury. Though he has played well in the scrimmages, Friday is truly his first game action against high level NBA talent since his second knee injury last November. Where are you on scale of 1 to 10? Rose was asked. “Eleven,” he answered. “I think that I’m back. I’m not worried about my knee anymore. I got three days under my belt and I’m just trying to keep playing hard and improve every day. It’s fun out here playing against these guys every day. They push me in different ways, especially playing against the bigs. It’s hard to finish on some of them the way that they block and contest shots. I think it’s going to help my game shooting a lot of floaters and pulling up. He’s (Krzyzewski) giving me the ability to play the way I normally play. He’s telling me I don’t have to call a play. Just come down, run pick and roll and play the way I normally play. I still feel strong. My body still is holding up. I still feel rested. I’ve been getting a lot of rest and eating right and getting the nutrition I need. The biggest thing is getting off my feet. And that’s what I’ve been doing, watching a lot of documentaries–Lance Armstrong, Pandora’s Box, Red Obsession about wine. Stuff I wouldn’t even think about looking at in the past. You can learn from anything. It’s better than watching reality TV–and watching a lot of movies. Rose will be on a team with Stephen Curry, Anthony Davis, DeMar DeRozan, Kenneth Faried, Paul George, Gordon Hayward, Kyle Korver, Mason Plumlee and John Wall. The “white” team for its jersey color will have Bradley Beal, DeMarcus Cousins, Andre Drummond, Kevin Durant, James Harden, Kyrie Irving, Damien Lillard, Paul Millsap, Chandler Parsons and Klay Thompson. That team is coached by Thibodeau. It’s a guessing game about the final 12, which probably won’t be determined until after a pair of exhibition games in New York City concluding August 22. Based on how coaches and players have been describing the team and style of play, those who seem most certain to make the final 12-player roster are Beal, Curry, Davis, Durant, George, Harden, Irving, Rose and Thompson. The most unlikely are the limited big men who don’t cover the floor like Cousins and Drummond. The Nets’ Mason Plumlee was elevated from the Select Team and looks like a more likely big man to add because of the way he runs the floor and his quickness. Since the USA team doesn’t have great size, they’ll probably prefer quick big men as the European game features big men who step outside to shoot. A guess of the last three spots would be Plumlee, Korver and Lillard. That would leave off Cousins, DeRozan, Drummond, Hayward, Millsap, Parsons and Wall. Though at this time it’s just a guess. Injuries and play in the exhibition games also can alter the rosters. “We’ve used Durant at center in the world championship gold medal game,” noted Krzyzewski. “He and Rudy Gay were our bigs. London (Olympics) he, LeBron and Carmelo were on the court at the same time. We are looking at zone (as well). Anything goes. It’s a 40-minute game. I don’t rule anything out. So will Thibodeau attack Rose with his defenders? 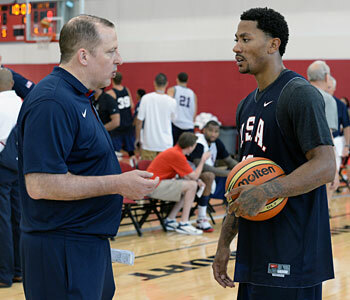 “I think his (Rose) approach is much better this time around,” Thibodeau said of Rose. “Obviously, a lot more patient. I think that he’s found a good rhythm in the game. He’s not forcing things. And the way he’s playing he makes the game easy for everybody. This isn’t NBA-level intensity. This is high-level talent, but you try to get practice as close to a game-like condition as you can and obviously that’s impossible. But that’ll be a game and there will be a higher intensity level. So that will be another good test for him.